You can find service status updates on our Twitter account @populrrmusic. I did everything in your how it works guide. How do I actually start my party? To start your party, simply play your party playlist through the Spotify app. Your device should be connected to the room/venue's sound system. Share a link to our website and your party access code with your guests. They'll be able to view the playlist from their devices and add/upvote songs. I've disabled shuffle, but the songs still play out of order! 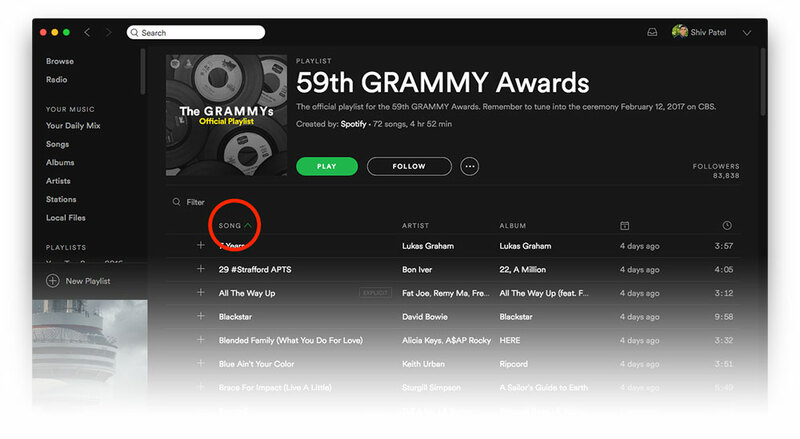 Ensure your Spotify player is not sorting the playlist songs by any of the list columns (e.g. song, artist, album, length, date added). The screenshot below shows an example of a playlist that will not play in order since the player is ordering songs by song name. To remove sorting on the desktop app, click on the column header until the green arrow disappears. My Spotify playlist isn't updating/syncing with Populrr! Please ensure that you've started playing the party playlist by opening the playlist and double clicking on the first expected song. Unfortunately, double-clicking on the playlist in the Spotify side-menu will only start the music, while preventing the player from detecting playlists updated (songs added, upvoted, etc.). If you're still noticing issues, please email us at team@populrr.com. My partiers can't hear music when joining the party page? Only the party host can play the playlist via the Spotify app. Guests joining your party can view the playlist, add songs, upvote songs, and see what song the party host is currently playing on his/her Spotify player. I added songs to my party playlist through Spotify, but don't see them in Populrr? You can force Populrr to refetch the playlist from Spotify by having an existing party guest rejoin the party or refreshing the party page on any device. Live usage shows more users than I actually have? To resolve this issue, we recommend disconnecting all party guests. This can be done by clicking on the link found under the Live Usage title on your account page. Your actual party users will receive a notification to rejoin the party. How many times can someone vote on a song? Each party guest can vote once per song every 8 hours. How can I request a refund for a paid party? If you aren't fully satisfied with your purchase, email us at team@populrr.com within 36 hours of your purchase and we'll refund your order. This FAQs didn't help. What now? Please email us at team@populrr.com and we'll get back to you within 24 hours. Already upgraded and having issues? No worries! We'll help you resolve the issue and refund your paid upgrade. All customer service and support inquiries should be sent to team@populrr.com. Upgraded parties will receive priority assistance. A member of our team typically responds within 24-48 hours.